For the longest time, professional sports existed within a machismo culture. This can still be seen at times, especially within the exceedingly dark underbelly of sexism in the new social media world. As we saw with the Carolina Panthers and former owner Jerry Richardson, that’s not limited to fans with worn-out dogmas linking us to a bygone era. In no way does this mean the NFL and other sports are not progressing in terms of equality. It does not mean that previous gender norms are being thrown out the window. When it comes to the leagues themselves, women have found a place and a purpose — both existing under the umbrella of mutual respect. It was the NBA that started what we now hope to be a growing trend. San Antonio Spurs head coach Gregg Popovich’s decision to hire former WNBA star Becky Hammon as an assistant back in 2014 brought this to the forefront. Since then, she’s been promoted to the top of the bench and has already received multiple head coaching interviews. What started out as seemingly a goodwill move from Pop has transcended how the broader sports world views a woman’s place in coaching. It’s no longer in just internships and the like. Moving forward, we’re going to see an advancement in equality among the coaching ranks we could have scarcely imagined just a decade ago. This has now been brought to the most macho of cultures in the sports world — the National Football League. Jen Welter: The first of many initial steps. Back in 2015, Bruce Arians and the Arizona Cardinals hired Welter as a training camp intern to coach inside linebackers. 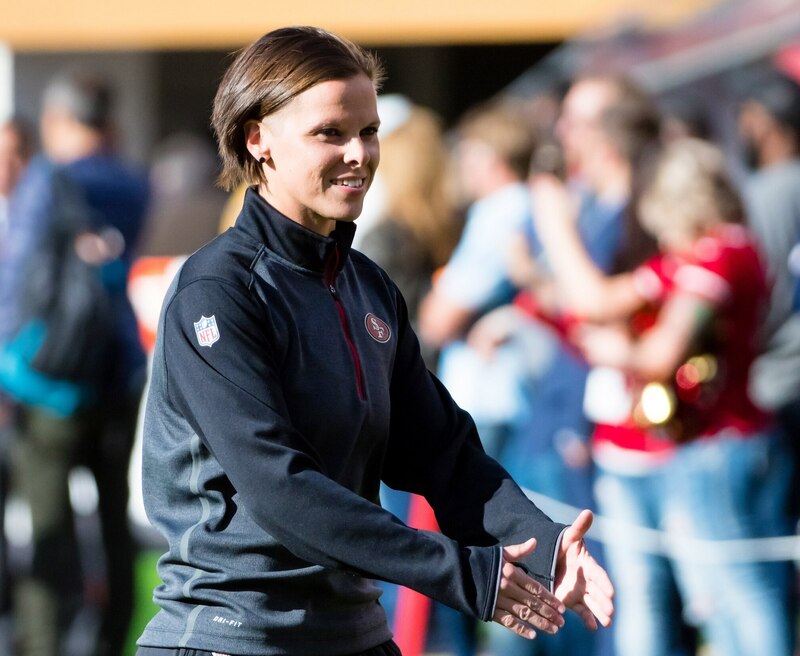 This made Welter the first female assistant coach in NFL history. “The biggest question coming in was would guys in the NFL respond to a woman coaching them, and the obvious answer is yes,” then Cardinals safety Tyrann Mathieu said at the time. Welter, 41, is currently a defensive specialist for the Atlanta Legends of the newly-born Alliance of American Football. Katie Sowers: Breaking many different barriers. An intern with the Atlanta Falcons under then-coordinator Kyle Shanahan back in 2016, Sowers followed Shanahan to the 49ers when he became their head coach. Sowers was initially a seasonal assistant with the 49ers under the guise of the Bill Walsh Minority Fellowship. That changed in 2018 when she became a full-time offensive assistant. Sowers’ path to the coaching ranks was complicated by her sexual orientation. She just recently became the first openly-gay coach in league history. “That moment really impacted me because it was the first time I truly felt judged because of my sexual orientation,” Sowers said when discussing a coaching job she had previously been turned down for. Kelsey Martinez: A return to the Raiders’ way. Al Davis was known for his inclusive ways. That included hiring the first African American and Latino head coaches in NFL history and selecting the first African-American quarterback in the first round. Obviously, former Raiders CEO Amy Trask is another example of Davis’ more inclusive approach. Martinez was brought on last year to be a strength and conditioning coach for the Raiders. “She’s been great working with the guys. I haven’t heard anybody complain or anything like that,” Raiders quarterback Derek Carr said last year. Lori Locust and Maral Javadifar: Bruce Arians, back at it again. It was just earlier this month that the new Buccaneers head coach hired two female assistants. This comes after he began the trend in Arizona years back. Locust will serve as the assistant defensive line coach — tutoring 300-plus pound men in the process. For her part, Javadifar will serve as the Buccaneers’ assistant strength and conditioning coach. “My hope is that pretty soon it won’t be news. That’s the goal: It’s not news anymore,” Arians said after announcing the hirings. Arians point about this not being news is spot on. It also leads us to an exclusive conversation Sportsnaut had with groundbreaking former Oakland Raiders CEO Amy Trask. Trask has an original view on what we’ve seen around the league over the past several years. The first female CEO in NFL history — under the guide of transcendent former Raiders owner Al Davis — Trask was at the forefront of the league’s changes. Back in 1983, Trask interned with the then-Los Angeles Raiders in their legal department. After being admitted to the California State Bar in 1985, Trask returned to the Raiders a couple years later. Within just over a decade she became the organization’s CEO in 1997 — lasting in that role for over a decade. As noted above, Trask’s personal experience adds a whole bunch to this conversation. For the common fan, those on the sidelines and within the coaching ranks are the ones that get most of the attention. But as Trask noted, there’s other women doing amazing work within front offices around the league. Bonk originally joined the then-San Diego Chargers as Chief Financial Officer back in 1991. With the organization since, Bonk was named Vice President in 2005 before being promoted to Executive VP in 2010. Then, back in 2016, Bonk was promoted to Chief Operating Officer. One of the most inclusive organizations in the sports world, the San Francisco 49ers brought in Gordon eight years ago. She’s served as Chief Administrative Officer and general counsel. In today’s NFL, that’s a huge front-office role. These are just a couple examples of women ascending the ranks of NFL organizations in recent years. But for Trask and others, it would mean a lot more if these types of stories weren’t actual news. That’s the thing. When something becomes the norm, no longer is it noteworthy. In a broader context, it’s the next step inclusive societies take. Women in these roles wouldn’t have been considered a possibility a quarter-century ago. While some will hang on to worn-out dogmas, current-day America and the umbrella sports fits under tells us a story of advancements in terms of gender norms and equality. Women are knowledgeable about sports. Through hard work and dedication, they have made it in a male-dominated industry. The next step is not having to write articles similar to this in the future. Is the person qualified? Did said person interview well? Would that person be a great addition to a coaching staff or front office? These are the questions Trask and others want to be asked moving forward. At the very least, we’re entering that stage in the development process. In and of itself, that’s a great thing.